There is much of symbolism in ceremonial worship. Worship of deities in different methods is done by different sects. But some of the processes are common among them. During worship, the worshipper sits on a seat in a particular Yogic posture conducive to high thinking. After bowing down to the guru, the spiritual teacher and Ganesa, the Lord of success, he purifies his hands etc, as well as the area and the ingredients with appropriate sacred formulas. After purifying the earth, sky, etc., he thinks of a fence of fire, putting water in a circle all around, meant to protect him from all physical and psychical obstacles. 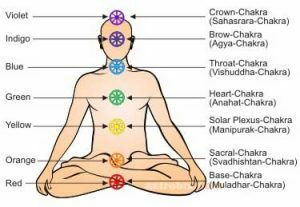 Then the purification of the elements constituting the body, called Bhuta-suddhi, is performed with Pranayama consisting of inhaling, retaining and exhaling the breath. The practice of Bhuta-suddhi done during ceremonial worship makes the worshipper pure. The Tantric idea is, ‘Worship God by becoming God\ Bhuta-suddhi is done thus: first, inhaling through Sushumna, one’s own Jiva is transferred to the feet of the Lord in the thousand-petalled lotus in the head. Then with the seed-mantra of air the dross in the spiritual body is dried up. Next, with the seed-mantra of fire the dross is burnt up; then the drossless body is bathed in ambrosia and then a purified body is generated; now the worshipper is free from all dross and equal to the spirit of Lord Himself. These practices are not meaningless formality but have spiritual usefulness as will be clear when we observe the life of Sri Ramakrishna who noticed the wall of fire around himself and also saw the Papa-purusha, the evil and dross personified. After Bhuta-suddhi the Sadhaka performs Nyasas touching the different parts of the body with mantras. Then he thinks of the deity occupying his body, mind, Pranas and sense organs. Then investing the Absolute with the form of his chosen deity, he meditates on Him as sitting in the heart. Then the deity is brought out to the Linga or flower, etc., representing the deity and taken back after worship. Different Mudras or gestures pleasing to the gods are then shown. They help in concentration also. Now, different articles are offered to the deity. 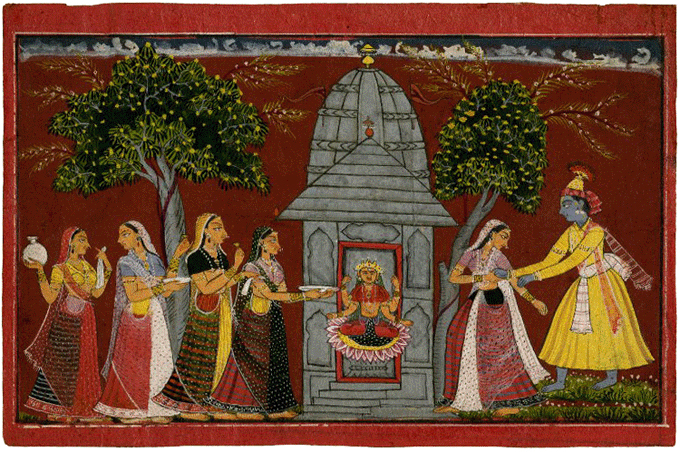 Next, offering handfuls of flowers and performing Japa, the fruits of worship are offered to the deity Himself. With bowing down, the worship comes to an end. For special worship, however, more elaborate rituals are prescribed. One thing to be noted in the ceremonial worship is that among the Vaishnavas, the stress is more on the seva or Kainkarya, the service of the deity exactly as we do to a very respectable beloved human being. The Smartas have great belief in the potency of the mantra and they believe that as soon as a thing is offered with a suitable mantra properly uttered, the deity accepts it. The Upacharas or the articles offered are really the manifestations of Prakriti. So the esotericism of the Upacharas is to conceive the return of the manifested universe to the unmanifested homogeneous unitary state, which is the Absolute, as a result of the effect of time, which itself is eternal and absolute. In its exoteric form, this truth assumes the shape of offering of the five fundamental forms of existence and becomes the Panchopachara. When material food is offered, the pranahuti mantra is uttered. 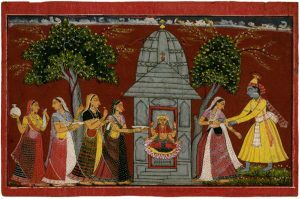 It denotes that the offering is really of the life-principle or the Para-Prakriti. The Amrita mantra denotes the immortal factor or ‘spirit’ as the material offered. In Panchopachara, materials are used only in elaborate worship but the entire worship can be performed mentally also according to Manasa-puja. Every deity is worshipped with 5, 10, 16 or 64 Upacharas or articles. They also have esoteric meanings. The five Upacharas of sandal paste, flower, incense, light and food signify trust, adoration, love, knowledge and identity. Another item alternative to food is water. It represents adherence. These however, are offered taking the deity as a very honoured guest. The worship in temples is conducted considering the deity as the king of the universe. The Arati is done waving before the deity the five articles of light, water, cloth, flower, and chamara (yak’s hairy tail). These represent the five basic elements constituting the world or the five basic forms in which all the material things are manifested. The system of Yoga has profoundly influenced all rituals. As for example, its influence is very evident in the ceremony of installation of an image of a deity. When an idol is placed in a temple, first an exca vation is made and some articles are placed successively with appropriate mantras. A support stone, a pot of deposit, a lotus bud, a form of a tortoise—all made of stone normally, are placed. Then follow an open lotus flower and a tortoise in silver, then the same in gold, and a hollow copper tube like the spinal cord. 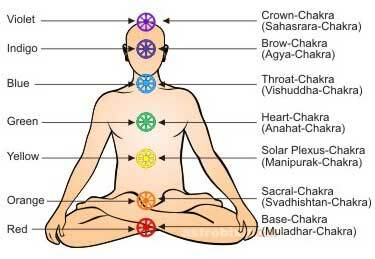 The enumerated articles are identified with the different Yogic centres in the body. This arrangement depicts the temple itself as the body of the Yogin. The actual idol is placed where the Sahasrara lotus would be. 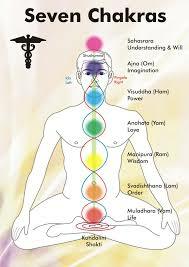 Thus a perfect and complete Yogic representation is given to the installed image. This practice of considering the human body as a symbol, as a temple of God is very common among the Hindu sects. ‘The body of ours is a temple of the Divine’, says the Maitreyi Upanishad (II. I). God resides in the heart of man and the sanctum sanctorum of the temple represents his heart. The heart is a cave and the king of the dark chamber is God; hence the sanctum sanctorum is purposely kept dark without any windows or ventilators; except for a small lamp in front burning day and night. The latter represents the lamp of wisdom that would be lit in the heart and kept burning constantly. Lights in the temple represent the light of the soul, the ever resplendent atma-jyoti. The clarified butter often supplied to the lamp stands for regular spiritual practice. The system of burning camphor before the deity means that our ego is to be set on fire with the flame of divinity. When all desires are consumed in the flame, the Jiva becomes one with the Lord. The Suprabhata song sung early in the morning for the purpose of waking up the Lord is really the waking up of the sleeping divinity in man. We have described a few of the Hindu symbols. The forms of deities will require a separate treatment which we propose to do later. The various symbols of religion have deep inner meaning. It is often so grand and poetic that to understand it is to find out the sublime but subtle truths of philosophy. A symbol is not a mere shadowy vision; it is the living revelation to saints and seers in their deep ecstatic contemplation. Thereby it has acquired its spiritual validity and usefulness. The goal of sadhana is the transformation of the worshipper into the likeness of the worshipped. It is based on forms which experience has shown to be fruitful. So there is no question of inventing a ritual or a symbol. That can be done only by an incarnation of God. The generally recognized effective forms of God are the traditional ones, for they have been used for ages. Spiritual growth comes through intense thought of God in different forms. ‘As are one’s thought and faith, such one becomes’, says the Chandogya Upanishad (3.14.1). The symbols help us to have this thought. If we know the spiritual meanings of symbols, they help us in keeping the mind in the thought of God. As a result, we shall climb gradually on the spiritual ladder and ultimately have the vision of the Supreme.